You can always rely on Bridport to come up with something completely different. And this year is no exception. More than 120 ukulele players, dancers, singers, actors and other performers are taking to the Electric Palace stage for five days in May for the UkuleleOpera, FLEA!, a big and bold, all-singing, all-dancing musical show about a little flea circus. From small beginnings, this show looks set to be huge, with fantastic stage sets and marvellous costumes in the pipeline and music from start to finish. It’s a community production, with Hester Goodman from The Ukulele Orchestra of Great Britain as its star and local people at its heart. It’s been written by composer Andrew Dickson, well known for his work with film maker Mike Leigh and winner of the European Composer Award for his score for the 1988 film High Hopes. Andrew has been at the forefront of the Community Play movement as part of the Colway Theatre Trust, writing the music for many productions, including The Poor Man’s Friend at Bridport in 1981 and five community plays at Dorchester. Former primary school teacher Sally Vaughan, the show’s producer, first came up with the idea four years ago. “At that time I was doing a lot of ukulele teaching and community group performances,” she recalls. “I started to think it would be great if the instrument were combined with other forms of performance. The word ‘ukulele’ means ‘jumping flea’ in Hawaiian, because the fingers are said to look like little fleas jumping when they pluck the strings. This made Sally think about doing a ‘Dance of the Jumping Flea’. She approached her friend Andrew Dickson, who liked the idea so much, he decided to write a community play based on it. The ukulele was the first instrument he learned, at the age of 11, and, for him, the circus is by far his favourite form of entertainment. He stresses that, despite its UkuleleOpera title, the show will ‘not be at all grand’. With Andrew Dickson on board, it just so happened that then Hester Goodman came to live in Bridport. She is a member of the musical ensemble, The Ukulele Orchestra of Great Britain, whose repertoire ranges from Tchaikovsky’s Sugar Plum Fairy and Ennio Morricone’s music for The Good, The Bad and The Ugly to Kate Bush’s Wuthering Heights, the theme from Shaft and Anarchy in the UK in the style of Simon and Garfunkel. Hester is originally from South Devon, but has spent most of her adult life in London until she moved to Bridport three years ago. “I got to know Sally when I first moved here and she and Andrew were talking about the idea and asked me if I’d be interested,” Hester says. “I had a look at the script and heard some of the music and I thought it seemed like a really exciting project to be a part of. It involves lots of people from the community and that’s really exciting. FLEA!, which runs from 23 – 27 May, will be directed by Niki McCretton from Bridport’s Lyric Theatre in Bridport, who also runs BACstage theatre group at Bridport Arts Centre. The show will feature beautiful costumes and a wonderful stage set. Choreographer Anna Golding was an early contributor and a big influence on the project—Sally says her work with the No Limits dance group was a huge inspiration. “It’s taken over three years to get the project off the ground because we needed to raise funds but we have now managed to do that and we can finally get the show on the road,” she says. And she paid tribute to Bridport Electric Palace, Arts Council England, West Dorset District Council and Bridport Town Council for their financial support. “Without their generosity, it wouldn’t be happening,” she says. “There were times along the way when it was looking impossible that we’d raise enough to fully realise the project. The production has captured the imagination of local people, who queued up to be a part of it. The story revolves around the central character, Madame Celine, the devious and rather exotic ringmistress of an extraordinary circus, which begins with human performers who turn out to be not very good. She recruits a circus full of fleas to tempt the punters in and ultimately make the loads of money. But the flea circus is cruel and exploitative and eventually the fleas rebel and uncover the cheating and manipulation. 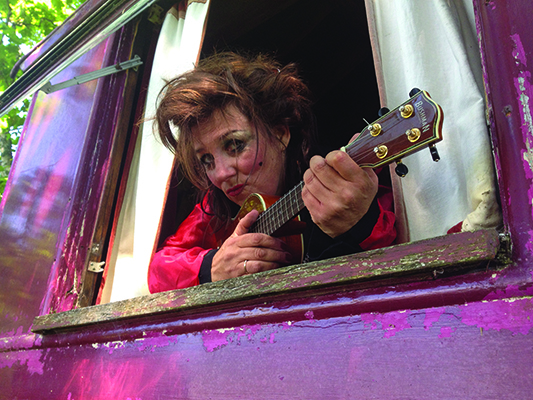 “Amidst this thread of the plot is, believe it or not, carefully woven the history of the ukulele, its origins, ethos, simplicity and sound becoming the core musical and theatrical backdrop to the show,” Sally says. But, like a parable for a modern age, FLEA! is a story about the power of small over huge, of simplicity over celebrity. Sally believes FLEA! will resonate with audiences, being original, written for the instrument and very carefully worked on so there is continuous music and song from start to finish—as you would expect in an opera but without the pomp. For Sally, UkuleleOpera is an entirely new venture, which involves so many strands of the arts and community. It’s a great feeling to see the idea she had four years ago shaping up in real life. “It’s also made my life incredibly busy—at least for the time between auditions and performances, there is little else I’ll be doing or thinking about. Watching people ‘get it’ and finding the characters interesting, or funny, or loving the music or enjoying the sight of the set, seeing people get enthusiastic about the prospect of bringing a character to life or enjoying the chance to bring their family along to see the show, the show that they will have helped create. There are now around 170 people actively involved in performing or helping produce FLEA! Tickets for FLEA!, 23 – 27 May, are available from www.bridportelectricpalace.org.uk or from Bridport Tourist Information Centre on 01308 424901.